Reviewed by Donna ~ 4 Stars! I will start by saying I love Jet, he was in the beginning your typical bad boy rocker…tats, piercings, a different girl every night…that was until he realised what he felt for Ayden and then he changed. They were friends before and had had this sizzling hot chemistry for over a year that both were extremely reluctant to persue in case it ruined what they had. You felt the pot bubbling over and you knew it wouldn’t be long before they both gave in to the inevitable and dive straight in. Although, Ayden…I found her extremely irritating at times, whilst I could appreciate she was trying to protect her past and make sure her future was not affected by any decisions that she made she put herself through hell just to maintain the façade. I thought that her and Cora’s ratings of Jet’s conquests were hilarious…and we were all awaiting that illusive perfect 10!! The ride was never going to be plain sailing, and it wasn’t, Ayden’s brother was the biggest fly in the ointment and I wanted to personally strangle her mother. She was the tough one of the family, thanks to one of her teachers at school, although even he sold her out to a degree in the end. She was always the one her brother would go to in times of trouble and she would always do whatever and I mean WHATEVER!!!!!!! She needed to do to help him and it was a times disturbing. I am just glad that he did seem to turn over a new leaf at the end. I am just so glad that Jet stood by her, gave her space when needed but more importantly was there when she needed him, even if it did take a kick to get him and his wounded ego to think straight. I thoroughly enjoyed this and I cannot wait for the next one. Jay Crownover is the bestselling author of Rule. 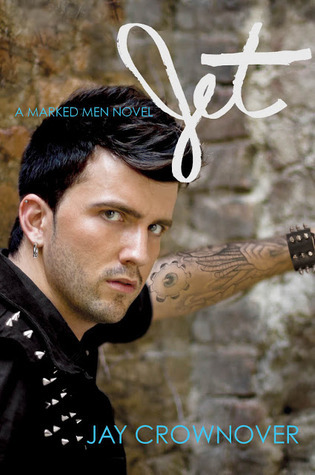 Like the characters in her Marked Men series, she is a big fan of tattoos. She loves music and wishes she could be a rock star, but since she has no aptitude for singing or instrument playing, she'll settle for writing stories with interesting characters and that make the reader feel something. She lives in Colorado with her three dogs.